Spearheaded by young and intrepid chefs around the world — the formidable David Chang might be the most obvious example — and in Hong Kong by local heavyweights such as May Chow, the surge of a new generation of chefs employing fine-dining techniques to unfussy food served in unpretentious settings is easily one of the most positive trends to hit F&B in recent years. The realms traditionally occupied by casual food and fine dining are starting to shift: the former becoming more sophisticated, refined and driven by technique; the latter starting to lose some of its white-tablecloth sheen. New Vietnamese eatery Nhau joins this new wave of sophisticated yet casual spots, and the fact that it’s serving Vietnamese food makes the restaurant a unique commodity on the current scene. 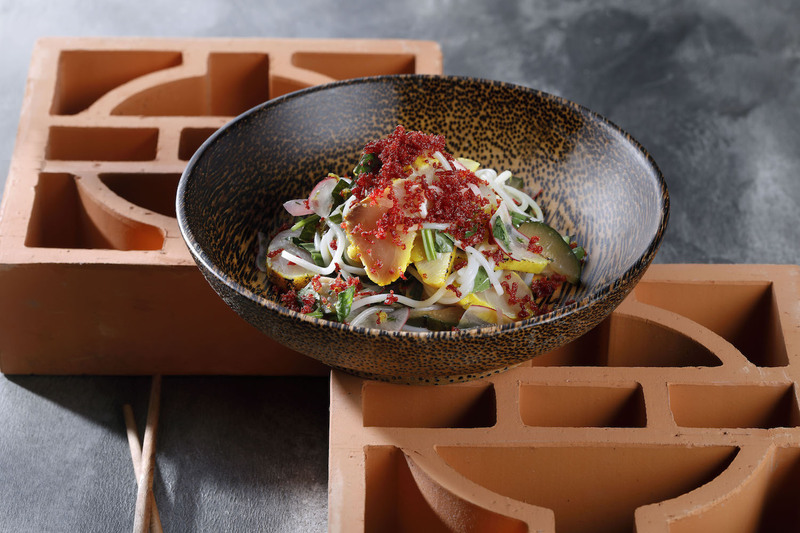 Chef Que Vinh Dang isn’t new to the Hong Kong restaurant sphere: His previous tenures include working under big-name stars such as Rocco DiSpirito and Geoffrey Zakarian, before making his name locally at private kitchen TBLS and Wan Chai restaurant, Quest by Que. Following a 2.5-year hiatus, Nhau is his first Vietnamese restaurant; tucked down a hidden lane just a short walk from Man Mo Temple, it’s proving to be one of the most promising new additions to the neighbourhood. Nhau recently popped up on a quiet laneway near Man Mo Temple. 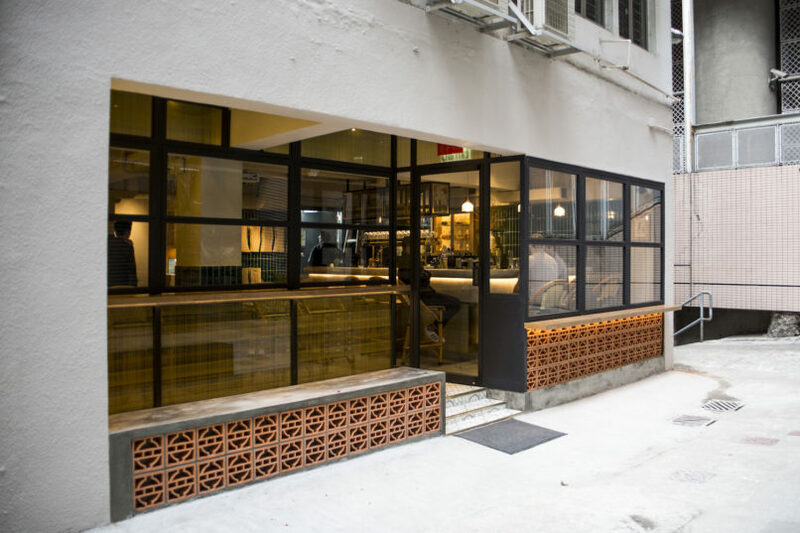 Dilapidated buildings, old antique shops, and eerily quiet laneways make up the immediate surroundings of Nhau’s brick-and-mortar eatery in the PoHo district of Sheung Wan, which makes it all that much more surprising when you stumble upon the cheerily bright restaurant. Sunshine-hued walls beckon to you from behind the modernist glass-and-black-steel façade; inside, diners can be seen propped up along the long counter bar, which is set against a teal-tiled backdrop and cluttered with various bottles and bitters. 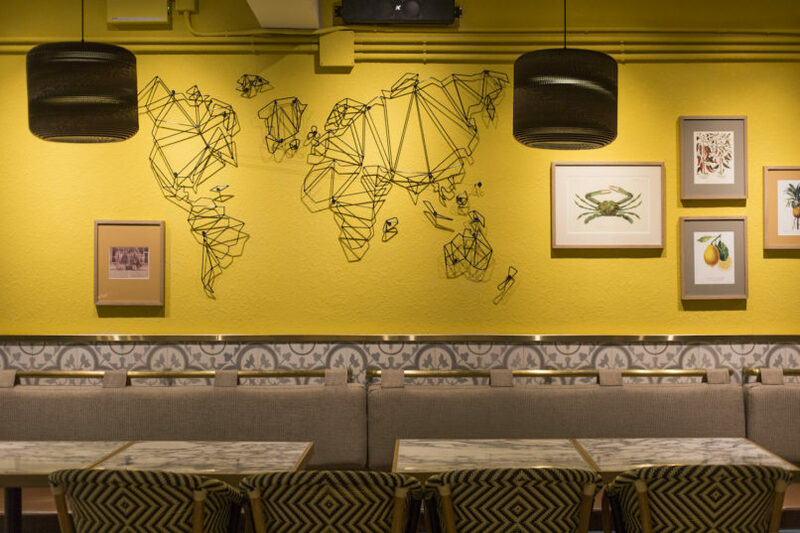 The sunny interiors offer a sanguine respite for hungry passers-by: bright walls are decorated with Ikea-like artwork of various flora and fauna, a few abstract art installations and framed food covers in a nod to those found in everyday homes across Vietnam. The modernist décor is cut by hand-painted vintage tiles sourced from Vietnam, terracotta bricks, and Indochine-style rattan chairs nestled around marble tabletops. Sunshine-hued interiors are decorated with framed artwork of flora and fauna. The restaurant seats just 40, with the banquettes along the walls offering perhaps the most comfortable seats in the house (this is also where large parties can set up with tables pushed together in a row). The rest of the four-tops are scattered somewhat awkwardly around the large tiled columns which divide the room, and we found ourselves jockeying uncomfortably for space all night; with our chairs pushed up against the table behind us, the waiters had to ask repeatedly for us to scoot in every time they passed through what should have been a clear pathway for service. With the eatery full on a Wednesday night, noise levels could reach unpleasant decibels, and I gave up on conversation with my dining partner halfway through the meal, my attention diverted instead to the buzz of service, from observing the frantically busy wait staff to glimpsing peeks through the half moon-shaped service window where bright orange flames glowed inside the wood-fired oven. Those seeking straightforward renditions of classic Vietnamese dishes will have to look elsewhere. Creatively composed and cleverly executed, the food at Nhau offers something vastly different than what’s being served in comparable Vietnamese canteens around Hong Kong. Chef Dang has taken the full breadth of his experiences — from perfecting fine-dining techniques to honing his streak of creativity — and used it to fuel the tank at Nhau, which seems to be firing on all cylinders (literally, as I observed the chefs wiping the sweat off their brows in the kitchen) despite being still in soft opening. The menu is succinct, but that doesn’t make it any easier to choose when you’re dining with a party of two. On most menus it’s easy to weed out the filler dishes; perusing the menu at Nhau, I found myself wishing I could try all 17 or so sweet and savoury items listed. The hamachi bowl uses turmeric two ways: as a seasoning for the fish, and as a fried batter topping. One of few raw preparations on the menu, the hamachi bowl (HK$180) is a good place to start, serving as a light introduction to the more funky, full-throttle dishes on the menu. Strips of pearly translucent hamachi are tinged golden with turmeric, splayed out on a bed of rice noodles tossed lightly in a fish sauce-fortified dressing which errs pleasantly on the side of subtle vs strong. (Given the ubiquitous use of fish sauce on the menu, including three nuoc cham sauces available as accoutrements on each table, we appreciated kicking off our meal on a lighter note). Elements of textural crunch are deployed to complement the soft noodles and fish, from crunchy pickles which lend acidity to slivers of fresh radishes and a snowfall of fried turmeric batter cleverly made to look like fish roe scattered across the top. 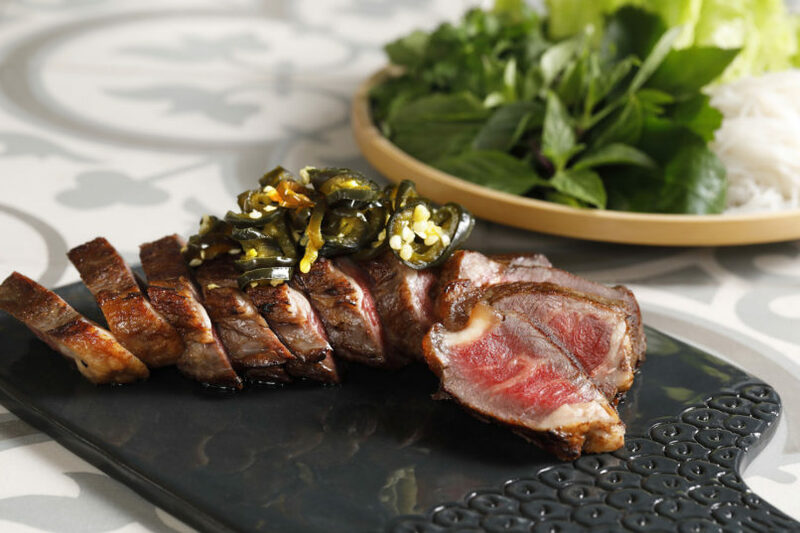 The bò lá lốt tartare (HK$140) is a clever reinterpretation of the traditional Vietnamese dish of grilled beef wrapped in fragrant betel leaves. Chopped finely, the raw Australian wagyu beef here is mixed in with a scattering of pickles and coated in a tangy sauce of betel purée and curry mayo. The dish arrives with puffed-up sheets of beef tendon as a vehicle for scooping; they’re fried to a shattering crisp, but are much too oily and leave a slick residue on our fingers. The cauliflower with pork koh quet should convert any veggie critics. Throughout the menu, chef Dang’s creative impulses diverge from those of a typical Vietnamese chef. While dishes are bound by core ingredients such as fish sauce, lemongrass and cilantro, it’s the extra elements that come together in surprising and harmonious ways — the mark of a cook who thinks deeply about the interplay of tastes and textures. 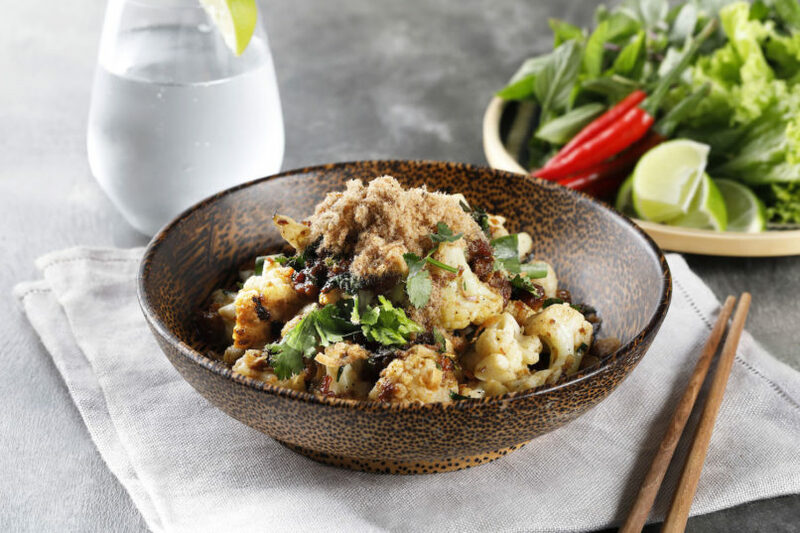 Above all, flavour is the driver of chef Dang’s cooking, as we found in the roasted cauliflower dish — a plate whose veggie-forward appearance belies the clever application of pork fat and caramelisation to add substance and depth. The florets are given a nice char and maintain a consistent bite, but it’s the “kho quet” that powers the dish: a sticky, sweet and sumptuous caramelised mixture of dried shrimp, pork bits, sugar and chilli which smacks of umami. Like the hamachi bowl, the dish is finished with a final flurry on top; this time, it’s a fluffy mound of dried pork floss, the flavour reinforcing the meatiness in the sauce. 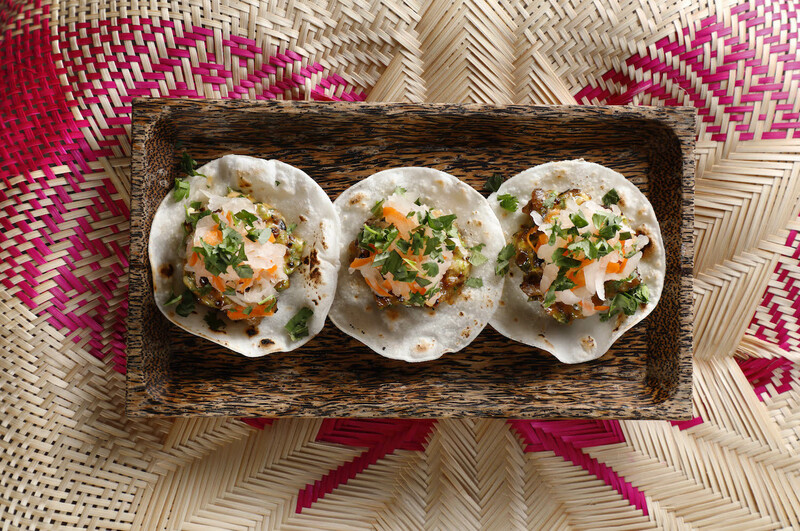 Don’t miss the banh mi tacos served on homemade rice tortillas. If Nhau had to advertise one plate as its “signature” dish, it’d likely be the banh mi tacos (HK$120): Neat, tidy and packageable, these two-bite wonders serve as more than just a menu touchstone and marketing ploy — they’re undeniably delicious, a punchy Vietnamese analogue to the ubiquitous Mexican street snack. Averaging to HK$40 per taco, the price is validated in the use of premium Iberico pork for the filling, with the smoky grilled meat cut through by a mess of pickled daikons, radish and chopped cilantro. 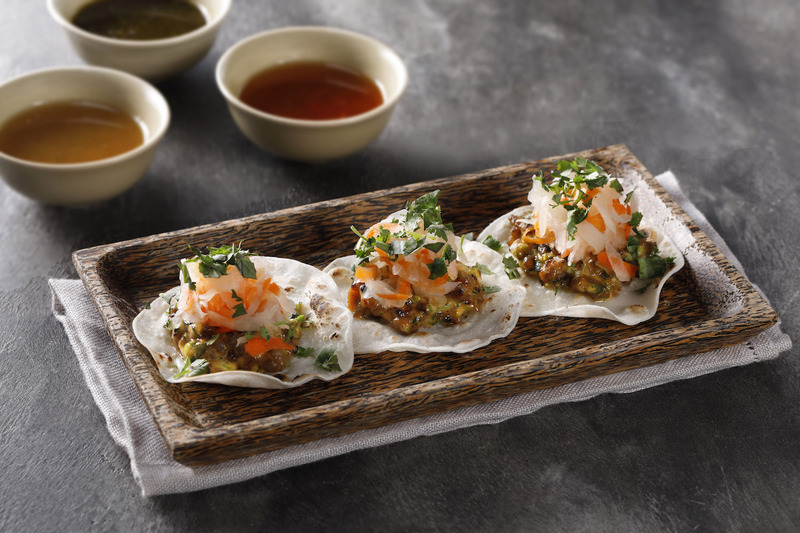 Soft and supple, the lightly grilled homemade rice tortillas make for an excellent wrapper, thin and pliable yet substantial enough to hold up the generous pork filling. The menu is decidedly geared towards carnivores, and the more substantial dishes are anchored by grilled meats: a whole spring chicken grilled and cured in fish salt; or a platter of dry-aged grass-fed striploin topped with a jalapeño relish. The pork belly bánh xèo is excellent (HK$160), with succulent strips of pork belly buried under a mound of sautéed bean sprouts and cabbage, scattered with peanuts for crunch and served with crisp rice crackers on the side (neatly solving the soggy pancake dilemma in traditional bánh xèo crepes). Meat platters include dry-aged striploin and slow-roasted chicken in fish salt. Dessert sundaes offer a refreshing respite from the savoury selections. Crafted around homemade ice creams (salted coconut caramel, coffee and pandan when we visited), they’re scattered with an array of toppings such as caramelised bananas, soft sponge cake and puffed rice. We order the pandan ice cream (HK$140), which is silky on the tongue and pure in flavour, although we find the accompanying sticky rice honeycomb too dense. Still in soft opening, Nhau has just received its liquor license, and diners can look forward to a handful of tropical-themed cocktails and a short selection of wines with a focus on chardonnay, which the restaurant recommends as the best pairing for their dishes. Nhau is a deeply satisfying and self-assured offering from a rising return star on Hong Kong’s restaurant scene — the dishes are bold, full of intention, and executed with finesse. The cooks have clearly been well trained; during the course of our meal, chef Dang stayed out of the kitchen, instead overseeing the front-of-house and chatting with guests, which included spending a good 10 minutes explaining to us the different grades in fish sauce (it should come as no surprise that Nhau uses only the best, a hard-to-find 40N aged fish sauce which Dang carries in his suitcase on trips back from Vietnam). A few of the servers seem quite green, although all remained professional, friendly and acquiescing to requests. There’s a slight disconnect between the high quality of the food and the desire to linger due to certain inconveniences (the spacing of tables, the untampered noise levels), but hopefully with a few tweaks Nhau can come into its own as a strong addition to the wave of fast-casual places reshaping the local dining scene. Although unassuming at first, the flavour-packed fare and firepower in the kitchen here is sending a jolt of electricity through this sleepy neighbourhood. And for those who’ve grown tired of the ubiquitous pho and banh mi shops — Nhau couldn’t have arrived any sooner. Opening Hours: Tues–Sat from 12:30–2:30pm for lunch, 6–10:30pm for dinner. Recommended Dishes: Bò lá lốt tartare, hamachi bowl, banh mi rice tacos, roasted cauliflower with pork koh quet, pork belly bánh xèo, pandan ice cream. Service: Friendly and accommodating, though servers could use more training on the menu.